Gas Pump Advertising Reaches 30,000 Captive Consumers! People will see your ad and take your cards! Gas Pump Advertising offers your business the opportunity to reach thousands of captive consumers affordably! 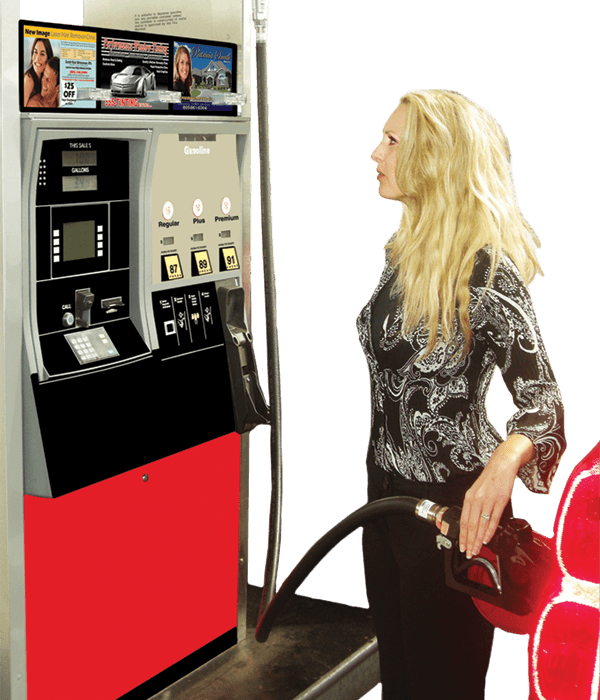 At the gas station, we STRATEGICALLY PLACE YOUR AD ON THE GAS PUMP IN FRONT of a large captive audience of up to 30,000 viewers per month as they wait captive and have nothing to do for up to 5 minutes. This is the reason why your business will receive the exposure needed to generate a response. With this kind of downtime, it’s essentially making your business the name and face of the community. With Gas Pump Advertising your business will get the Repeated Exposure it needs! In order for advertising to be effective, it generally needs to be seen by the same people multiple times ” Repeated Exposure” before a response is made. People need to refill their gas 2-4 times per month, often more than that. Having your ad at the gas station on the gas pump means your ad will be seen by them multiple times significantly increasing the response to your ad! We design your professional gas pump advertisement for FREE! We have been doing gas pump adverting for nearly 15 years. We have worked with thousands of clients. We know how to create an effective advertisement that attracts attention. Our professional graphic designers will work with you from start to finish creating your top quality advertisement for FREE! cards, serving as a physical reminder of what they saw at the gas station. This makes your company accessible to potential customers after they’ve left the gas station. Our large list of active locations gives our customers the ability to target a specific area or canvas an entire region. Gas Pump Advertising makes it easy for businesses to reach a large captive audience in their own community! Call today to check availability in your area at 1-800-469-1120. Everyone has to get gas multiple times per month! Advertising on the pump strategically reaches them! Gas pump advertising targets thousands of people! At the gas pump people stand waiting for 5 minutes! Your ad is placed in front of your potential customers!